The employee team at Fresenius Medical Care is made up of innovators and change makers whose passion and dedication enable us to deliver the highest quality care to people living with kidney disease, helping them to lead longer, better and healthier lives. A perfect example of this is Akhila, a Senior Manager of Manufacturing Engineering. 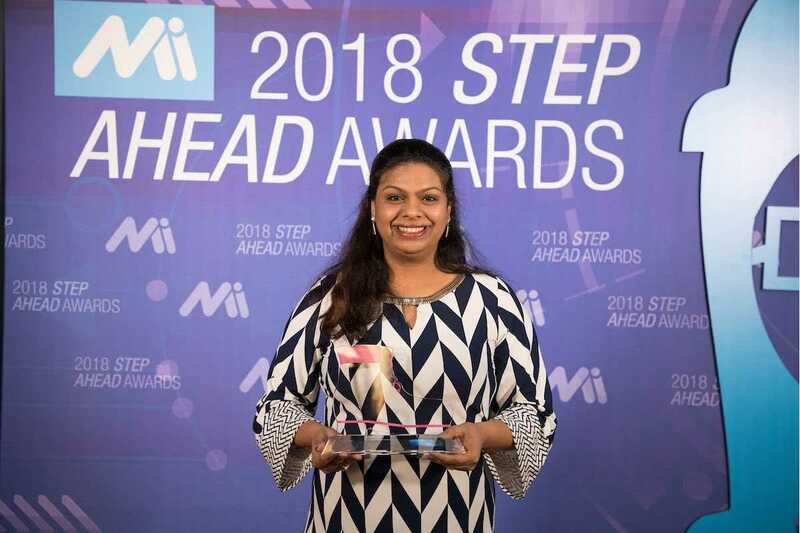 As an integral member of the Fresenius Medical Care team for the past 6 years, she has proven to be a woman leader in STEM, and recently received a STEP Ahead Award from the Manufacturing Institute, an affiliate of the National Association of Manufacturers (NAM) for her phenomenal work. We spoke with Akhila about her career journey with Fresenius Medical Care, the importance of teaching young girls about STEM, and how she’s impacting patient lives every day through her work in manufacturing engineering. See what she had to say and learn how you, too, can be a part of our team today. How do you feel about winning the STEP Ahead Award? I think it’s validation for the work that I do. I’ve now been with Fresenius Medical Care coming up on six years and one month, and whether it’s internal feedback, something bigger like nominating me for the STEP Ahead award, or promotions … I think all of that validates what you do, and I think it’s really important. What led you to work with Fresenius Medical Care? The big thing was when I came in for my interview, everyone I interviewed with had risen through the ranks. To me, career growth is extremely important. I think having met all of the individuals who started in the field then grew into more managerial roles – to me, that was what sold me on Fresenius Medical Care. How has Fresenius Medical Care helped you to grow in your career? Giving me extra responsibility has been a big help. Sometimes it helps me grow by just throwing me in the deep end. It’s a great way to learn. When you’re put on a project, being able to go present to people and speak on the work you’ve done has been great. It’s given me a certain amount of confidence. I think apart from that, the promotions have been great. It sort of goes side-by-side with the added responsibility. A lot of times, I had the responsibility before I got the promotion, so I knew going into my next role that I could do it. What are some innovative projects you’ve worked on recently? One of the things I’ve been working on is looking at how we can make our existing products better in terms of patient experience—whether improving the process of how we build [a product] with better testing, or working on new design changes for an existing device. It comes with a lot of challenges, but that’s what helps you learn and grow. How do you see yourself making an impact with the work that you do? I think the biggest thing is that I work on a device that helps improve peoples’ lives, and that is extremely important to me. What’s really great about Fresenius Medical Care is the fact that the patient is at the center of all that we do. All our positions are driven by how it impacts the patient. That kind of mission motivates me for what I do. Why do you think there is still a gender imbalance in this industry? What types of things can be done to change it? I think one thing, in general, is that not a lot of women are encouraged to get into the STEM education system from the time they are young. If you don’t get children into STEM education until they’re in middle school, then it’s already too late. I think a lot has to do with what kind of emphasis is being put on the importance of STEM when they’re in school. What advice would you give to young women thinking about a career in STEM? With STEM, as long as you’re able to do your job, you can have a really secure life, professionally. There’s just a lot of opportunity that exists. It challenges you and encourages you to constantly think. I think it’s very, very important that girls realize the really interesting stuff that goes on in STEM and that it’s not boring. I think STEM is a really great career choice and a very secure one. Are you ready for an exciting new opportunity that allows you to be a part of the fascinating work at Fresenius Medical Care? Take charge of your career and explore our openings today!